James and John were ambitious. They knew that great things were in store for Jesus and those who followed him. They wanted to be rewarded and recognized as Jesus’ closest disciples. We are ambitious. We like to be acknowledged. We want God to bless and prosper us right here, right now. We want mom and dad’s approval. We want classmates to envy us. We want the corner office at work. We want to be the Joneses in our neighborhood. But because of our sin, we all fall short. We fall short of other’s expectations, of personal goals, of God’s glory. Jesus had ambitions too, and he did not fall short. He did not come to earth to push people around. He had his sights set on saving humanity from the damning consequence of sin. He came to serve the world by offering his holy life as a payment for all sin. And God gave his approval of Jesus’ work by raising him from the dead. By faith in Jesus, we have God’s full acceptance. We are his beloved children in whom he is well-pleased. Since we already have God’s full recognition, we don’t need to seek it from the world. Motivated by the Son of God and empowered by the Holy Spirit, we are free to use our energy to serve others. 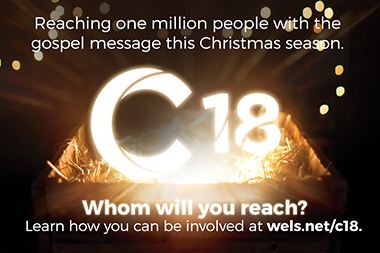 Our ambition is that others see Jesus in us and hear about him from us, so they become God’s children too. Dearest Jesus, forgive me for my selfish ambition. Grant me a spirit of humility and a heart that looks out for the needs of others. Amen. What was Ruth thinking? She had married into a family from Israel after they had immigrated into her country of Moab. This family experienced great misfortune. They had left Israel because of a famine. The father of the family died before Ruth married his son. Then both sons died, leaving only Ruth, her mother-in-law Naomi, and a sister-in-law. When Naomi decided to return to Bethlehem in Israel, Ruth went with her. Why? If Ruth went back with Naomi, what did her future hold? Ruth would be living in a foreign land far from her parents and siblings. Customs would be different. Ruth’s chances of remarriage were slim. When Ruth swore faithful, unwavering love to her mother-in-law, what was she thinking? Could Ruth have been thinking about the God her new family had shared with her? This God promised to rescue his people from their guilt and sin. Were his promises more important to Ruth than a comfortable life in Moab? We can find “spiritual” people who promise to make us prosper, give us a fantastic marriage or career success. God’s promises are different. He doesn’t promise a pain-free life filled with success. He promises to take care of our deepest needs—our brokenness because we have insisted on living our lives on our terms, not God’s. God sent his Son Jesus to heal us of our brokenness and take away our guilt. Jesus suffered in our place to restore us into God’s family. Jesus fills our hearts with joy, peace, contentment no matter how pleasant or painful our life is right now. Ruth knew God’s forgiveness was far greater than any short-term struggles she faced in Israel. She wanted to stay with the God of undeserved love who healed broken people. God makes the same promises to us! Lord, help me look past my current struggles and heartache to see your promises of forgiveness, comfort, rescue, and healing. Strengthen my faith to think about my eternal hope. Amen. How long, O LORD, must I call for help, but you do not listen? Or cry out to you, “Violence!” but you do not save? Why do you make me look at injustice? Why do you tolerate wrong? Destruction and violence are before me; there is strife, and conflict abounds. God will also take care of justice here on earth—in his own time and his own way. Sometimes we will have to wait patiently for God to act. Most importantly for us, we know God has already acted to forgive our sin. We never have to fear that he will punish us. Jesus took our place! Lord, bring about justice in your own time and way. Give me patience when I am troubled by injustice. Give me a stronger faith that you will never condemn me, despite my sin. Jesus died in my place, for which I am eternally grateful! Amen. Declare [the LORD’s] glory among the nations, his marvelous deeds among all peoples. When you see something amazing, you just have to share it: the grandeur of a waterfall or canyon, an astounding play or accomplishment in an athletic contest, an inspiring performance on a stage, or anything else that strikes you as rare and remarkable. You want someone to know what you saw and to share in your excitement and amazement. The Bible is filled with awe-inspiring scenes and stories, and they are all true. God speaks, and a beautiful world unfolds before him out of nothing. God intervenes, and kingdoms rise and fall according to his plan. God acts, miracles happen, and life is never the same again. Heaven opens, and the Son of God is born of a woman. Shepherds come from near, wise men come from far, and they return home, telling others about the things they have heard and seen, declaring God’s glory among the nations. The grave opens, first to receive the Son of God after he is crucified on a cross, and then to reveal that the Son of God has risen from the dead three days later. And friends and followers go out to tell the good news, declaring God’s marvelous deeds among all peoples. Because people like them shared the good news with you, you know and trust Jesus, the Savior who came to live in your place, to die your death, and to rise again for you. As you hear and read what the Bible says, you see more of the grandeur of God’s plan to save you and of the heaven that is waiting for you. You witness the awesome way that God won the victory over sin and death for you. You watch an inspiring and flawless performance that changes your life forever! Thank God for those who have shared Jesus with you. Then go, spread the news! Tell those near and far about the marvelous deeds God has done for you and for them. Invite them to church with you. Share a devotion on social media. Talk to a friend about what you’ve heard, seen, and read. What God has done is too amazing to keep to yourself! Amazing God, your deeds are marvelous and amazing. Move me to declare your praises wherever I go. Amen. A PERSONAL PRAYER BEFORE WORSHIP Dear Heavenly Father: I come to your house today to worship you, to give you the praise you deserve and the prayers and hymns you desire. Through your Word and Sacrament, come to me. Take me by the hand and lead me to the cross where your Son offered sin’s sacrifice once and for all. Forgive my sins, strengthen my faith, assure me of my salvation, and inspire and empower me to do good works. Teach me today to look up to Jesus and live by faith. Bless my worship. Amen. 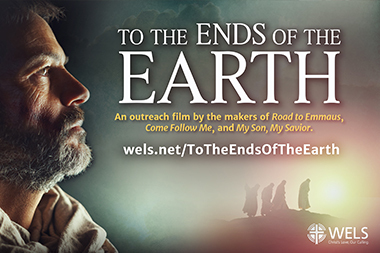 TODAY’S SERVICE Today we take a break from our usual liturgical service w/ readings, hymns, and sermon, and view a 40-minute DVD recently produced by the WELS entitled: “To the Ends of Earth.” Our lone Bible reading is from Acts. Acts 1:8-11 describes Jesus’ ascension 40 days after Easter where he commands his disciples: “You will be my witnesses…TO THE ENDS OF THE EARTH.” Acts 16:6-40 describes the Apostle Paul’s mission trip to Philippi where he and his traveling companions meet Lydia, a slave girl and a jailer and his family. It shows how Paul connected people from all walks of life, demonstrating that the good news of Jesus is indeed for all people to the very ends of the earth. that Jesus Christ is the One who saves. has come to them today! go make disciples for Jesus the King. then get up and get out and go! the name of the Son and the Spirit, too. and teach them in love just as Jesus taught you. but he’ll be with you and that is enough! salvation has come to them today! when you bring tidings of peace and good will. Jesus the King will come back again. Salvation has come. Not ev’ryone knows. Go into the world. GO! Minister: In the name of our God, to whom all hearts are open and from whom no secrets are hidden. Amen. Minister and Penitent: O Lord, hear my prayer, listen to my cry for mercy, and in your faithfulness, come to my relief. Do not bring your servant into judgment, for no one living is righteous before you. Answer me quickly, O Lord; my spirit fails. Do not hide your face from me, for I have put my trust in you. Show me the way I should go, for to you I lift up my soul. Teach me to do your will, for you are my God. Penitent: Almighty God, merciful Father, I, a troubled and repentant sinner, confess that I have sinned against you in my thoughts, my words, and my actions. I have not loved you with my whole heart; I have not loved others as I should. I am distressed by the sins that trouble me and am deeply sorry for them. Here the penitent may confess specific sins. Minister: Jesus says to his people: “If you forgive the sins of any, they are forgiven.” His death paid for the guilt of your sins and the sins of the whole world. Do you believe this? Minister: Because of the promise of our Savior Jesus, I forgive you all your sins. Be assured that you are a dear child of God and an heir of eternal life. Minister and Penitent: O Lord, my God, I called to you for help, and you answered me. I thank you for the love you have shown me in Jesus Christ, my Savior. Through him you have rescued me from the guilt of my sin and given me the peace of forgiveness. Help me fight against temptation, correct whatever wrongs I can, and serve you and those around me with love and good works. In Jesus’ name, I pray. Amen. Minister: Go in peace. The Lord be with you. They were looking intently up into the sky as he was going, when suddenly two men dressed in white stood beside them. “Men of Galilee,” they said, “why do you stand here looking into the sky? This same Jesus, who has been taken from you into heaven, will come back in the same way you have seen him go into heaven. On the Sabbath we went outside the city gate to the river, where we expected to find a place of prayer. We sat down and began to speak to the women who had gathered there. One of those listening was a woman from the city of Thyatira named Lydia, a dealer in purple cloth. She was a worshiper of God. The Lord opened her heart to respond to Paul’s message. When she and the members of her household were baptized, she invited us to her home. “If you consider me a believer in the Lord,” she said, “come and stay at my house.” And she persuaded us. Once when we were going to the place of prayer, we were met by a female slave who had a spirit by which she predicted the future. She earned a great deal of money for her owners by fortune-telling. She followed Paul and the rest of us, shouting, “These men are servants of the Most High God, who are telling you the way to be saved.” She kept this up for many days. Finally Paul became so annoyed that he turned around and said to the spirit, “In the name of Jesus Christ I command you to come out of her!” At that moment the spirit left her. THANK YOU to Joe Zauner Sr. for the matched donation of $2,200.00 from WE Energies to St. John’s. We deeply appreciate it. THANK YOU FOR YOUR FALL MISSION OFFERINGS! $287.00 was collected at St. John’s for the current Beaver Dam Circuit LWMS home and world mission projects. 75% of the total will benefit Campus Ministry New Starts and Haiti Projects. 25% will go to home and world mission projects to be decided by voting in May and announced at the upcoming 2019 LWMS Convention in Des Moines, Iowa. Thank you for loving missions! LWMS “FUN” QUIZ WINNER At the Befriend A Mission display in the linkway during September, a number of inidividuals entered our “Fun” Quiz. By getting all the answers correct, their names were entered in a drawing. Cassie Doering is this year’s winner. 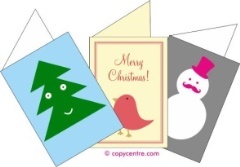 She will receive a box of cards, pen, and LWMS stickers for sharing encouragement with missionaries! ST. JOHN’S DIRECTORIES ARE HERE! If you sat with Lifetouch for a photography session and had a Lifetouch photo put into our new directory, come pick up your free directory in the link way. If you submitted your own photo and would like a directory, they can be purchased for $10.00 ea. PLEASE MUTE YOUR CELL PHONES before the worship service begins. No texting while driving or worshiping. WANTED FOR BOOK FAIR The following items are wanted for use & decorating this year’s book fair: clothes rack, clothes hangers with clips (need about 25), artificial Christmas trees (5ft & under), white Christmas lights, Christmas light up deer, fairies, butterflies, unicorns, knomes, butterflies, etc. Anything that would work for our theme, “A Christmas Enchanted Forest”. If anyone has & is interested in donating/helping, please contact Heather Schwochert at 608-369-1084. Thank you everyone! MEN’S BIBLE CLASS There is no Men’s Bible Class this week. Class will continue next week, October 31, at St. John’s. CHRISTIAN ONE-LINERS (from a WELS member): We’re called to be witnesses, not lawyers or judges. BE HEALTHY IN BODY, SPIRIT AND MIND Lutheran Counseling and Family Services of Wisconsin (LCFS) offers professional mental health counseling to adults, adolescents, children and families that are experiencing anxiety, depression, Post-traumatic Stress Disorder (PTSD), life transitions, grief, relationship issues, substance abuse and much more. Our counselors see clients at 10 locations across the state, as well as in participating elementary and middle schools. If you know someone who may benefit from the caring services of our professional counselors, please encourage them to learn more about LCFS and call for an appointment. LCFS has offices in Central and Northeastern Wisconsin in Berlin, Waupaca, Shawano and Green Bay. LCFS accepts most insurance coverages, is licensed by the State of Wisconsin and provides outpatient services to all. Learn more at www.lcfswi.org or call us at 888-867-4840. ADOPTION SERVICES Whether you or someone you love is facing an unplanned pregnancy or you are considering growing your family through adoption, the professional counselors at Lutheran Family and Counseling Services of Wisconsin can help. Our staff helps everyone involved explore the social, financial and emotional issues involved in a decision to keep and raise a child or giving a child up for adoption. All of the children served in our adoption program are placed in strong Christian families and we ensure we provide the best outcome for all involved – the birth parents, the adoptive families and most importantly, the child. Learn more at www.lcfswi.org, or contact us at 888-867-4840. THRIFT STORES VOLUNTEERS NEEDED The Second Time Around Thrift Store, 102 West Franklin in Berlin, WI is looking for volunteers willing to give just a few hours a week working at this store. We offer flexible hours for both men and women and promise of time well spent! This store is run completely by volunteers and proceeds from sales come back to the store in the form of care and support from Lutheran Counseling and Family Services which provides counseling services for mental health issues, addiction and adoption. Volunteers are need to sort donations, mark prices, display merchandise, test or repair small electronics or appliances or work the check out. Please consider volunteering a few hours a week to this worthy cause! It means SO much to SO many! For volunteer information, contact the Store Manager at (920) 361-0334. THE TOP FIVE CONCERNS A recent study named the top five most significant problems facing society today as being family breakdown, alcohol and drug abuse, chronic mental health concerns, equality issues and caring for aging parents. 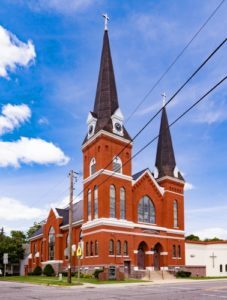 Not ironically, Lutheran Counseling and Family Services of Wisconsin works daily to resolve these issues through marriage and family counseling, treatment for alcohol and other drug abuse, child and adolescent counseling and addressing geriatric mental health issues. You or a loved one do not need to struggle alone. Help is available. LCFS has satellite locations across the state with highly skilled and compassionate therapists who can help individuals steer through even the darkest of times. Seeking counseling is an act of courage. If you are ready, contact us at 888-867-4840 or find a location near you at www.lcfswi.org. A little boy opened the big and old family Bible with fascination, and looked at the old pages as he turned them. Suddenly, something fell out of the Bible, and he picked it up and looked at it closely. It was an old leaf from a tree that had been pressed in between the pages. “Everyone who calls on the name of the Lord will be saved.” How, then, can they call on the one they have not believed in? And how can they believe in the one of whom they have not heard? And how can they hear without someone preaching to them? “You say it best when you say nothing at all.” This 2002 song by Alison Krauss remains popular because most people know someone who shows them love in non-verbal ways. You can enjoy fishing with grandpa all day without saying a word. Conversing with your next-door neighbor may be like pulling teeth, but when you need help, he is the first to show up. “You say it best when you say nothing at all.” That one phrase can probably describe a relationship or two in your life. But that one phrase should not sum up the entire relationship! No one likes to receive “the silent treatment.” Wives appreciate the occasional spoken “I love you” from their husbands. Sometimes, words are needed! Words are definitely needed in a human being’s relationship with God. Sure, God shows love in non-verbal ways. This time of year, we are reminded how the Almighty shows kindness to all by giving “rain from heaven and crops in their seasons” (Acts 14:17). But what happens when there is too much rain, causing homes to be destroyed and lives to be lost? A word from God is needed! A clear preaching of the truth to make sense of the seemingly contradictory “non-verbal” cues that God is throwing at us. The apostle Paul reminds us that we have such a word from God in the good news of Jesus Christ the Savior from sin (Romans 10:17). But how can people believe in Jesus if they have never heard of him? How can they hear without a preacher? Think of some of the times when your life seemed like nothing but pain and confusion. The sunsets and gentle breezes that God sent you may have been nice, but better by far is the preacher of good news who was sent by God to tell you that your sins are forgiven! Because of Jesus’ suffering and death on the cross you are right with God. Because of Jesus’ resurrection from the dead, you too will one day rise into a beautiful new heaven and new earth. Words are needed to convey these precious, saving truths to people like you and me. Words are absolutely necessary to convey these beautiful, saving truths to everyone around us. How can they hear without someone preaching to them? Preaching means telling good news with true words from Scripture. These words don’t have to be overly complicated. It can be as simple as the apostle Paul telling a terrified jailer, “Believe in the Lord Jesus Christ, and you will be saved” (Acts 16:31). Silent love from God is important. But only the spoken word of God’s love saves! (Romans 1:16) Words are needed. God’s Word gives us what we need. Dearest Jesus, thank you for loving me enough to reveal yourself to me through your word in the Bible. Use my words, simple as they may be, to share you and your saving love with others. Amen. Our holy God was justly offended by the sins of Israel, and threatened imminent destruction by the hand of enemy nations, which ultimately did happen. But ironically, at this point Israel still asserted that the Lord God Almighty was with them. That seems overly simplistic: “Seek good, not evil.” How would you apply this to your life? How would you define those simple words? “Evil,” perhaps, is most easily defined, but maybe not so much when our sins include complacency and smugness regarding our relationship with God. “Good” is a profound word in the context of the holy will of the Lord God Almighty. In his holy eyes nothing short of perfection is good. Yet, the forgiveness of sins won for us by the life, death, and resurrection of Jesus, his Son, is GOOD NEWS, the gospel of salvation for sinners. Now, as redeemed children of God, “good” includes everything that describes the life of faith to which we are called and to which we are guided by Scriptures. It involves living and growing in faith, eager to share our faith in Jesus with those who need to hear the GOOD NEWS. How do we “seek” good? Since the Holy Spirit creates faith in us by the gospel, the “seeking” begins there. None of us can be perfect till we are in heaven. Therefore, “seeking good” is a part of humble daily repentance. Trust in Jesus, plus “seeking” the guidance of the Scriptures in Bible study and worship, asking the blessing of the Holy Spirit, define “seeking good” for every facet of our lives. That’s godly advice from Amos, in troubled times, and all the time! Dear Holy Spirit, graciously help me to seek the good of the gospel that I may live now and forever with you, the heavenly Father and the Lord Jesus the one, true “Lord God Almighty!” Amen. Do you ever find it difficult to pay attention? If so, you are not alone. According to a recent study the average American attention span has fallen to 8 seconds. 8 seconds! Professional marketers have noticed this trend and are reacting accordingly. YouTube videos and internet news articles are getting shorter. Twitter and other social media platforms limit the amount of characters users can include in their posts. Everything is sound bites and video clips. Counter to this fast-moving culture with little or no attention span, these words from Hebrews Chapter 3 tell us: fix your thoughts on Jesus. With these words God is asking us to think very carefully about Jesus, to focus our attention on him. This involves investing more than 8 seconds of our time. That is easier said than done, isn’t it? It is so easy to lose sight of Jesus, especially as we swipe from page to page on our cell phones in mere seconds and scroll down our social media feeds as hundreds of images flash before our eyes. But even when we put our devices away, we struggle with focus. We are distracted by sin and temptation. We think about so many things during the day that must get done. We dwell on decisions that must be made, and we bounce from one thing to the next in our hectic lives. Somewhere in all the chaos, we lose sight of Jesus. We lose our focus on the One who truly matters. Thank God that our Savior focused his attention on us. As our Savior lived in our place on earth and journeyed toward the cross, he never lost sight of you and me. His love for us and his dedication to God’s saving plan kept him focused. He did not let himself get distracted. He fixed his eyes on the goal and he laid down his life as our substitute. His death in our place has removed all our sins, even our sin of failing to give him and his Word our attention. We are forgiven and as our verse says, we now share in the heavenly calling. We are going to heaven through faith in Jesus! In this fast-paced world, Jesus has given us something to focus on: himself. He wants us to reach our heavenly goal. He knows that when we focus our attention on him, we will reach that goal. Dear Jesus, thank you for focusing your attention on me. Thank you for going to the cross to pay for all my sins. Help me always to focus my attention on you and your Word, that I may not lose the heavenly home that you have prepared for me. Amen. You need money. There’s no way around it. You need a job to make money. You need to perform at your job to keep receiving money. You need to plan and budget to manage your money. And you need to work with your spouse and family to communicate how to spend your money. You can’t live without money. So why does Jesus say that being rich is so dangerous? Doesn’t he understand that we need to pay our bills? Why does he say that having a lot of money could keep us from entering the kingdom of God? Wouldn’t life be easier if we just had more money? Money is a good thing. But money becomes a bad thing when we make it our ultimate thing. Money can easily become our functional god. When we look to money to give us ultimate happiness, money has become our god. When we look to money to give us a sense of peace and security, money has become our god. When we give all our time and effort to making money, we are worshiping money like a god. We have all done this. At one time or another, we have looked to money to give us what only God can. If money has become our god, how then can we possibly be saved? Jesus did the impossible. He left the riches of heaven to be a poor human. Through Jesus’ death and resurrection, you, a poor human, have become spiritually rich. Trusting in Jesus as your Savior, you are a child of God, an heir of the King. Now, instead of worshiping your money, by God’s grace, honor God with your money. God, my Father, thank you for providing all that I need for my body and life. God, the Son, thank you for giving me the riches of your grace and forgiveness. God, the Holy Spirit, lead me to treasure what is truly valuable in your eyes. Amen. It is a challenging situation. Is more faith needed to forgive someone, or is more faith needed to tell a tree to be uprooted and planted in the sea? Jesus’ point is not to decide which requires more faith. Rather, he stresses the importance of faith in a person’s life. While some may maintain faith is unnecessary or it is only for the weak, Jesus provides a completely different perspective. It is possible for me to forgive someone who “sins” in a general way. It becomes a completely different situation when a person sins against me. Then it would be easier to tell a tree to be uprooted. However, faith makes what may seem impossible, possible. Jesus emphasizes the power of faith. It not only trusts the words and promises of God, it puts them into practice. Faith takes hold of me, a sinner, and changes me. I receive sight to see what is pleasing to God. I receive new life to rejoice in being called a child of God. I even receive the ability to willingly do what God commands. Dear Savior, I thank you for the gift of faith which brings me peace through the forgiveness of my sins and leads me to delight in doing what you desire. In humility and confidence, I ask you to increase my faith. Amen.